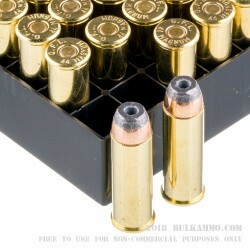 Do you hate buying ammunition without being certain of its quality, and find that you've got to ask yourself one question: "Do I feel lucky?" Well, you needn’t do that when you invest in Fiocchi. They’re one of Italy’s oldest and largest ammunition manufacturers, and put intense care into making certain all of their components are crafted according to exacting standards. 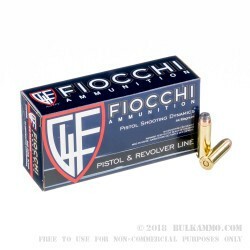 Fiocchi’s been around for so long that they actually had to make the switch from muzzleloaders to breechloaders. 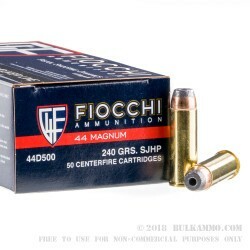 This 44 Magnum cartridge is a versatile one thanks to its 240 grain semi-jacketed hollow point projectile -- it’s great for self-defense, will reliably drop medium-sized game in spite of their objection to the proposition, and is priced affordably enough for range training as well. 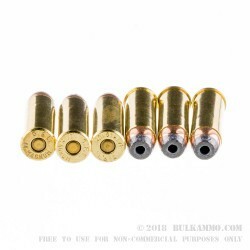 The bullet’s partial jacket prevents excessive lead fouling and facilitates penetration, and during penetration ensures that the expansion created by the hollow in the tip occurs in an orderly and predictable fashion.